This species is accepted, and its native range is Uganda to Zambia. Annual. Culms geniculately ascending; weak; 30-55 cm long. Leaf-sheaths as wide as blade at the collar, or narrower than blade at the collar. Ligule a ciliate membrane. Leaf-blades spreading, or reflexed; lanceolate; 1.5-3.5(-4.5) cm long; 1-4 mm wide. Leaf-blade surface glabrous, or pilose; sparsely hairy. Leaf-blade margins glabrous, or ciliate (clavellately). Leaf-blade apex acute, or acuminate. Inflorescence a panicle. Panicle open; oblong, or ovate; 1-6 cm long; contracted about primary branches. Primary panicle branches bearing spikelets almost to the base. Panicle branches pilose; with clavellate hairs. Spikelets solitary. Fertile spikelets pedicelled. Spikelets comprising 1 basal sterile florets; 1 fertile florets; without rhachilla extension. Spikelets oblong; dorsally compressed; 1.2-1.5 mm long; falling entire. Glumes dissimilar; reaching apex of florets; thinner than fertile lemma. Lower glume ovate; 0.33-0.5 length of spikelet; membranous; without keels; 0 -veined. Lower glume lateral veins absent. Lower glume apex acute. Upper glume oblong; 1 length of spikelet; membranous; without keels; 7 -veined. Upper glume apex obtuse. Basal sterile florets barren; without significant palea. Lemma of lower sterile floret similar to upper glume; ovate; 1 length of spikelet; membranous; 7 -veined; obtuse. Fertile lemma oblong; dorsally compressed; 1.2-1.5 mm long; indurate; pallid; without keel. Lemma margins involute. Lemma apex obtuse. Palea involute; indurate. Africa: west-central tropical, east tropical, and southern tropical. Aquatic annual with weak culms 30–55 cm. long. Leaf laminae 1.5–3.5(4.5) cm. long and 1–4 mm. wide, narrowly lanceolate, often clavellate-hairy on the margins, acute or acuminate. 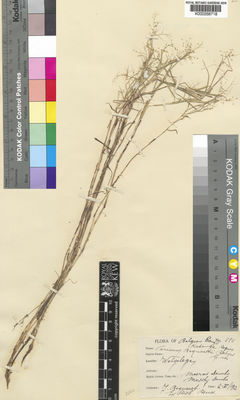 Panicle 1–6 cm. long, ovate or oblong, clavellate hairy. Spikelets 1.2–1.5 mm. long; oblong; inferior glume ovate, 1/3–1/2 the length of the spikelet, nerveless; superior glume 7-nerved; inferior lemma 7-nerved, sterile, its palea poorly developed; superior lemma dull. Aquatic annual; culms weak, slender, ascending, 30–55 cm. long. Leaf-blades spreading or deflexed, narrowly lanceolate, 1.5–3.5(–4.5) cm. long, 1–4 mm. wide, widened or straight at the base, membranous, glabrous or sparsely pilose, often clavellate-hairy on the margins, acute or acuminate. Panicle ovate or oblong, 1–6 cm. long, sparsely branched, the secondary branches often severely contracted and then the primary branches raceme-like, clavellate-hairy. Spikelets oblong, 1.2–1.5 mm. long, glabrous; lower glume ovate, 1/3–1/2 the length of the spikelet, nerveless, bluntly acute; upper glume oblong, almost as long as the spikelet, 7-nerved, obtuse; lower lemma broadly ovate, 7-nerved, sterile, its palea poorly developed; upper lemma exposed at the tip, pale, not glossy. Swamps and marshy ground; 1140–1650 m.
Clayton, W.D. & Renvoize, S.A. (1982). 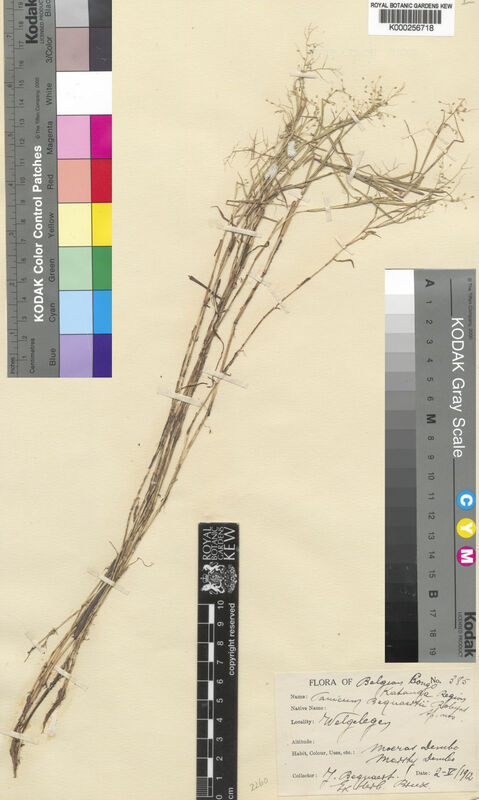 Gramineae Flora of Tropical East Africa 3: 451-898. Robyns, Fl. Agrost. Congo Belge 2: 165 (1934).